Having a fridge full of carrots and an open container of chicken stock, I decided to make carrot soup. Midway through the soup-making, I realized that I own none of the following: a blender, a food processor, a Magic Bullet ™, or a potato masher. I was also getting hungry, and my arms were tired from all the push-ups/pull-ups/ballet I’ve been doing since I quit my job. The result: pureed carrots. They were delicious. I deviated considerably from the recipe I was looking at, which is from the vaunted Moosewood Cookbook , which I now want to check out. I started by heating the olive oil and butter (yes I used both) in a stock pot over medium heat, and sauteeing the shallots and garlic for a couple minutes. I added the carrots and sauteed for a couple more minutes, then added the broth and salt. I brought the whole thing to a boil, then lowered the heat, covered it, and simmered for about 15 minutes. I added a generous dash of cinnamon by mistake, but it worked out fine. I killed the heat, mashed the carrots with a fork until I got lazy, and dished up a mushy bowl full of “soup.” It reminded me of the type of thing you eat when you get your braces tightened (a la Just As Long As We’re Together by Judy Blume). According to the recipe, you would have simmered the carrots in the broth separately, sauteed an onion, garlic, and other seasonings separately, and combined them all into a blender to puree. You can then whisk in a dairy product — cream, yogurt, etc. right before serving. I had half and half and Greek yogurt in the fridge, but I didn’t think it was necessary (and possibly would have been nasty-looking, given that my carrots were still chunky). 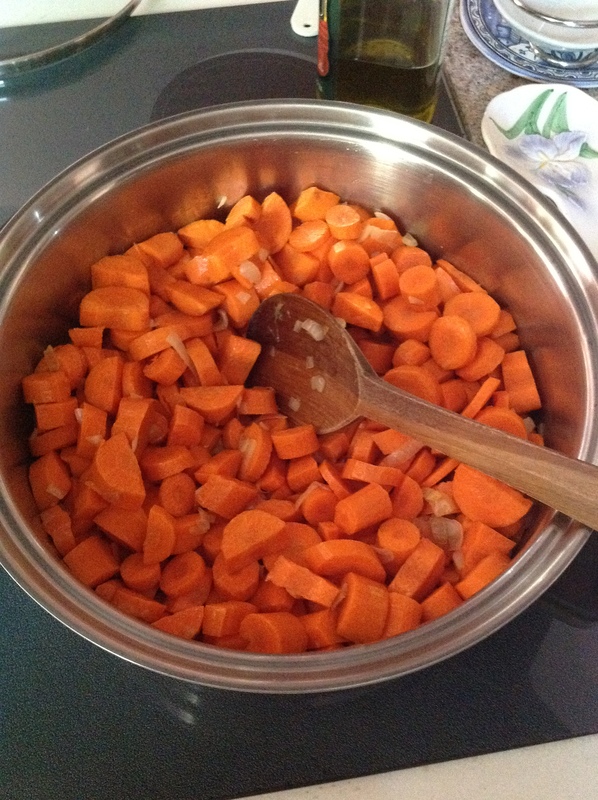 This entry was posted in Recipes, Side Dish and tagged Broth, carrots, SOC, Soup. Bookmark the permalink.